CBSNY BEST OF BEACH READ SELECTION! This exciting debut novel written by former Secret Service Agent J.A. Ballarotto is by no means an ordinary kiss and tell story. Set in 1963, it sweeps the globe from New Jersey to Las Vegas to Cuba and back to Dallas, as it tells the story of Jake, a young Italian Secret Service Agent who finds himself on the trail of a band of resourceful counterfeiters. 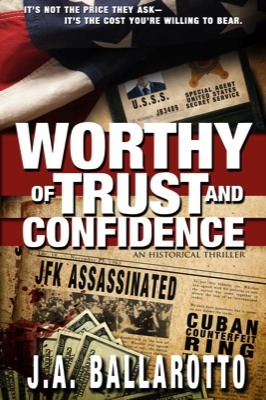 Our rebellious hero becomes hopelessly infatuated with a gorgeous yet unattainable redhead, a testarossa in every respect, who, together with a Cuban secret agent, embroils The Secret Service and The FBI, as well as the New Jersey Mafia in the most diabolical conspiracy of the century…the assassination of JFK. The story takes the reader through a twisted and at times terrifying journey where the good guys are enigmas, the bad guys are heroes and the girls are always tantalizing.